The Rev. Paul Zahl, dean of the Cathedral Church of the Advent in Birmingham from 1994 to 2004, has taken a job as rector of All Saints Episcopal Church in Chevy Chase, Md., effective Dec. 9. Zahl left July 31 as president and dean of Trinity Episcopal School of Ministry in Ambridge, Pa., a position that he left Birmingham to take three years ago. While Zahl was dean at Cathedral Church of the Advent, membership expanded from about 2,400 to 3,400 at Birmingham’s largest Episcopal church. I write to you today with profound joy to report that on September 12, 2007, our Vestry of All Saints Church voted unanimously to call The Rev. Dr. Paul Zahl as our next Rector, and that Paul has accepted. Both Bishops Edward Salmon and John Chane approve the call. In each position, Rev. Zahl distinguished himself as a visionary, confident leader and gifted pastor. His leadership style is to develop a strong clergy team and staff and let them execute their duties without micromanaging. This strategy succeeded at the Cathedral of the Advent, where the congregation grew to 4,000 under his leadership. Paul is a strong Christ-centered, Biblically-grounded, orthodox priest. Indeed, he may be the country’s best-known, non-bishop, orthodox priest. However, his orthodoxy is not harsh or Law-centered. Rather, in the tradition of the great Protestant Reformers, his theology is centered on the Grace of God as the only hope for sinners. Paul is also an internationally known preacher and teacher. His sermons are conversational in delivery, intellectually challenging, inspiring, and Biblically based. His recurring theme is the difficulties of the human condition and God’s antidote, Grace. His sermons — peppered with allusions to movies, old and new … novels … even rock ‘n roll — appeal to both young and old. Many of his sermons are available on the websites of both Trinity and the Cathedral Church of the Advent. Paul has been blessed with the twin gifts of a powerful intellect and lots of energy. He’s a graduate of Harvard, the seminary in Nottingham, England, and the recipient of a doctorate in theology from the University of Tubingen, Germany. Not only is Paul a charismatic leader of intellectual attainment, he places a strong emphasis on pastoral leadership. He’s warm, engaging and funny on a one-on-one basis and in group situations. He cares about people and where they are on their faith journey, constantly challenging them to grow. Paul’s wife Mary is bright and charming, and is nationally-known in her own right as a landscape designer. She is Paul’s teammate in the truest sense of the word. Their three grown sons are all in ministry: one, to be ordained by Bp. Salmon, serves in South Carolina … another in graduate school in theology at Cambridge University, England … and the third, who married Tom and Ann West’s daughter here at All Saints last weekend, is starting a ministry in New York City working with college students; he previously led a successful Alpha program at Harvard. Paul grew up in Washington and graduated from St. Albans School. Although never a member here, he sang as a boy soprano in the All Saints choir when Richard Roecklein was choirmaster and retains a warm feeling for our church. Paul is comfortable with our current relationship with the Diocese of Washington as mediated through Bp. Salmon. He advocates less focus on the politics of the wider church, instead building the church at the local level regardless of what happens in the national church. We believe this is consistent with All Saints needs and desires. Paul will begin serving as our Rector on December 9. I pray you will join your Vestry in welcoming Rev. Zahl and supporting him in the spiritual growth of our church family. BB NOTE: Al Zadig, the former rector, is now rector of St. Michael’s in Charleston, SC (where Ed Salmon is bishop, who will continue providing oversight to All Saints, Chevy Chase). 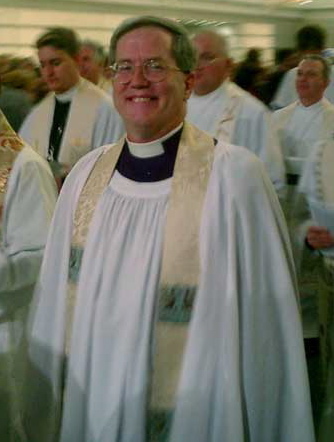 The former Associate Rector, Layne Hansen, is one of the clergy on staff at Christ Church Savannah who last week had his license revoked by the Bishop of Georgia. You can read more about that here and here and here. But it is very good news for All Saints to have Paul Zahl at the helm. My prayers are with him and that wonderful community in Chevy Chase. ← Why does Dylan still matter? Thank you for the update, I’ve not seen Al for a long while and missed his departure to St. Michael’s. Having heard his testimony, everything is full circle. I’m happy for everyone in this circumstance. I had wondered what was next for Dean Zahl after he left, and what was next for All Saints after Al Zadig’s departure.This is indeed great news, both for the parish and for Dean Zahl.